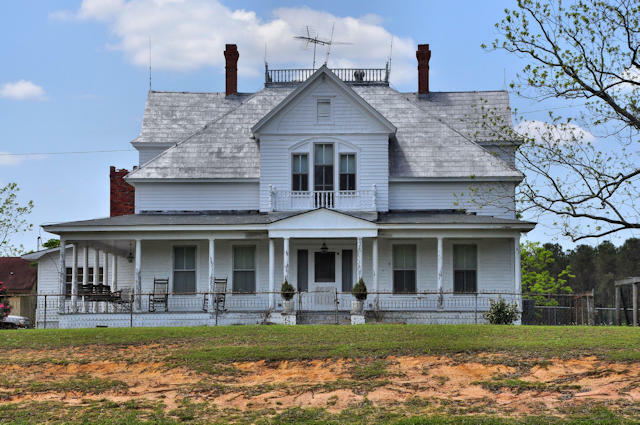 Built by Dr John C. Nevil, this beautiful home is a well-known landmark on U. S. 301. Dr. Nevil’s son, Paul, a sheriff of Bulloch County, also resided here. Originally built as a modest three-room house in 1902, it was expanded to its present appearance by local carpenter Butler Barr in 1910 using pattern books typical of the Victorian era. The home also served as Dr. Nevil’s medical office. so huge..a real family home. I know I would love living in this home. Loved seeing this big old house. I grew up in a similar home in southern Ohio. Reminded me of an old habit that I had. My mother worked 3-11 shift & I was responsible for keeping the home tidy. Since I had two little brothers who were giant mess makers, I would stay up after everyone went to bed. I’d turn on lights in every room of the house except where someone was sleeping. Then I’d clean & tidy each room & turn th light out. There were eleven rooms, so I burned te midnight oil! Imposing. There’s certainly a majesty about it.